This trip could easily be sub-titled “The Find a Builder Trip”. We have arranged to meet with three new builders as it is clear that Peter is not going to honour his contract or refund us our deposit. What do you do with a secondhand cement mixer? Travel home day. Got up to a seven o clock alarm and got bathed and breakfasted quickly. Then finished packing up the house before Adbellah arrived as arranged. Again he arrived early! In Spain! He measured up and quoted. Lynne decided that it needed doing and agreed to the price. So she wrote another cheque as a deposit on this work and Abdellah went off looking pleased. He had just upped the total contract value by about 20%, his boss had to be pleased with him. We then did the final packing up stuff and checked the water which was 569.6 m3 so we used just under 7 cubic metres in the fortnight including some serious watering. Then we called down to Keith’s to say goodbye, which involved a brief chat and a cuppa, so we set off for the airport about 15 minutes later than planned but still in good time. Good job too. All the roadworks on the motorway near AlicantÃ© are now finished and we were presented with a split that was Murcia and the Airport to the left and AlicantÃ© and the Airport to the right. Not being sure which was the usual route I chose left and we had an interesting time on a low tank taking 15-20 minutes longer than usual, going about 30 Km further than usual and paying ‘‚¬2 more on the toll to learn that the correct choice is AlicantÃ© to the right. Still that meant the check-in queue was minimal and we got through security quickly enough to give us time to have our picnic lunch before boarding. We pushed back 15 minutes early but that gain was lost in the wait for our baggage at Leeds/Bradford. Nevertheless we were in the Club starting our first drink by six o clock. Another adventurous trip to CalpÃ© over and done with. We are actually looking forward to the next one! Another gentle start getting ready for our eleven o clock appointment with Abdellah at the Monasor showroom. It surprised us with its size, the quality of the products they stocked and its overall professional air. This time the qoute was 99% correct and still significantly lower than Tristan’s guys. Lynne was so relieved! Especially when we realised that they had still left out the new pillar and Candido told Abdellah on the phone to throw it in free. We told him that we would make a decision and let him know before the end of the day. Over a cuppa at CafÃ© Dany’s we decided to follow up on the other two builders and give them a last chance to quote. So we tried to contact them. The English builder Mick (Michael Smeeton) who was our architect Manolo’s recommendation had been ill and wasn’t ready and the other guy wasn’t answering his phone. We had also planned to drop Manolo’s project folder off at the Abogado’s office but over the cuppa had decided to hang on to it, just in case. We called in to tell them and Lynne asked about the situation vis-a-vis the errant German builder’s cement mixer taking up most of our garage. She tried to call him; his mobile was switched off and the landline to his home was disconnected. We were advised that we had made what could be construed to be a reasonable effort to contact him but they didn’t want to know what we did with it. We had to call into Manolo’s office to collect the copies of the plans we had arranged to have made for whichever builder we engaged. On the way Lynne decided that she wanted Monasor, not just because their price didn’t break the bank (big a factor as that was) but also because she had confidence in them not to let us down. They are too big and have too big a reputation to risk it. So we called Abdellah and arranged to meet with him again at the showroom to sign a contract with them. Then we went to a cafÃ© near Manolo’s office at the Esmerelda and I bought Lynne a small bottle of fizz to celebrate, persuading her to break her no drink at lunchtime rule for once. They gave us two oysters with it as tapas, and Lynne enjoyed them a lot. So fortified Lynne called Tristan to break the news and I texted the other two builders to say we had made our decision. Talk about taking it down to the wire! From Tris’s point of view it wasn’t all bad as it left us the funds to paint the house and he is doing that sort of work now so we told him we’d be after a quote next trip. The afternoon was taken up with some packing up of the house before we went down to Monasor and did the paperwork. Lynne is so relieved that its over and we are confident about the work being completed. Abdellah reckoned that they would complete all the work in about six weeks, which means that we will need to travel out around the end of July to inspect and make the final payment. 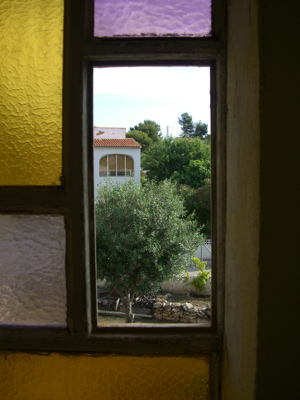 She also asked about the stone facing around the bottom of the house to protect the new rendering and Abdellah arranged to meet us at 9:30 the next morning to measure up before we had to set off for the airport. From Monasor we went to Mejias III for a meal and a few drinks. Told El Hefe (the boss) that we were leaving and got a warm farewell again. Got home to find samples of stone under the gate with a card and a note from Abdellah confirming his appointment next morning. This increased confidence even more. Yet another delicate start! 🙁 So didn’t make it to the ten o clock tram to Altea as planned and the eleven o clock was about twenty minutes late. Needed a cuppa when we arrived in Altea after a delightful train ride with views that were new to us. All of which meant we made the market about twelve with an hour to get around the whole thing, not impossible. I bought another pair of pants and a replacement ‘man-bag’ as the current one is getting too floppy and tatty looking. Lynne enjoyed a good bit of retail therapy as an antedote for all this builder bid tension. Enjoyed the ‘tram’ ride back to Calpe as much as the ride there. The new trams are really quite posh and do raise it up from being a quaint narrow gauge railway. Got home about three, which gave two hours for a late lunch before the gardener and his builder came with their quote. The quote was exactly for what we had asked including their additional suggestions but broke the bank by about 5%, which meant us subbing the work and there being no contingency left afterwards. Not a situation we liked at all. So then we called Monasor, our German neighbour’s builder to enquire about their quote as they hadn’t called as promised yet. We arranged to meet Abdellah at the house at about seven. Their quote was way smaller but digging into the detail they had not got all of the work included. Abdellah went around again and remeasured, and he seemed much more focussed on his own without his boss Candido with him. He promised to rework the quote by 11 o clock the next morning, so we agreed to meet with him again then. Felt despondent as we headed for our watering hole. We had hoped that they would prove the best. The mismatch had dented our confidence in them quite badly and we were thinking that it was break the bank time with Tristan’s guys, not a happy prospect. Another slow start day with a delicate edge! Decided to invite our good neighbours for drinkies and nibbles the following evening. Managed to flag Keith down and asked when he drove past the door while I was in the garden. As I was ‘taking out the trash’, taking a bin bag to the bazura I was spotted by a builder whose van was marked Dari Construction. He drove back to the gate and asked to quote, to which Lynne agreed. He seemed very nice and was attentive to the detail. He reckoned he’d seen the owner around the place last summer, which confirmed our suspicion from the unexpected electricity consumption in July and August that our errant German builder had been living in the house even though he’d denied it. The builder promised to e-mail us a quote early next week. Eventually went into town to get the rest of the cigs we wanted. Lynne bought some masking fluid to execute a water colour idea she had and we bought some clip frames to hang a couple more personal touches at Camping Nirvana. Had our second breakfast at CafÃ© Dany’s which has had a face lift with new glass decals and colour scheme to the signage. Drove up to the station to find the times of the tram to Altea for the next day’s trip to the market. Stopped to shop for the drinkies event and saw the other guests from last Saturday walking along the road and pipped the horn and waved as we disappeared around a corner. So we decided to invite them as well. Got their number from Keith and called. And they accepted. Had a huge salad lunch. Passed the early evening walking the other promenade, the one the far side of the PeÃ±on from us and decided it is decidedly down Market compared the nearer one. More touristy compared to the Madrillien that occupy ‘ours’. Ended up at our favourite watering hole for few, including the usual tapas so no need for supper. Spent too long on the balcony with the brandy bottle before retiring to bed. A suitably lazy Sunday start before getting ready to go out. We decided to drive into the Jalon Valley to a place called Alcalali. This takes us through Jalon itself where we have been to the Saturday Flea Market. We Spend a bit of time driving through the tiny streets of Alcalali before deciding to drive on to Parcent, thinking we have never been there before. Only to realize when we get there that this is where our neighbour Keith brought us for paella with his Sunday lunch group a few years back. A lunch that turned onto an almost unpleasant ‘let’s knock politicians especially Labour ones’ session. The up side being that it has meant that we haven’t been asked to join that group again. So we had a wander around, though there’s not much to see except where to get lunch. We looked at L’Era where we had the paella before but it looked like a private Christening party by the look of the cake in the centre of the room with a huge, white, plastic Stork on it. In the end we chose a beautiful hall-like building with a bar near the door and a full procenium arch (albeit small) and stage. The tiles around the Walls were beautiful. The staff were helpful and we both enjoyed our choices from the menu del dias at ‘‚¬11 each. It was the Co-op Agricola ‘El Progres’. We are starting to find our own watering holes and lunch venues at last. After returning home to charge phones we took ‘a promenade’ in the eveming sun along the seafront before abusing the Hotel Diamonte Beach’s WiFi over a few. Another great Sunday. What brilliant chill out day! We agreed that we could give CalpÃ© Market a miss this morning and just had a lazy morning before going down to our neighbour’s for a lunch of nibbles and drinkies. We were not the only guests with a couple we had met a couple of years ago also being invited. The nibbles were cooked on the barbarcoa. The other guests left but it was clear we were welcome to stay on and talk for ages with more drinks. Now we are on our balcony having a few more drinks in a lovely evening breeze. I guess that this is all for today. We had planned to go on the boat to Benidorm today but it was very grey and misty when we awoke so we called it off. Of course by the time the boat was scheduled to depart but too late to get down to the port to catch it, it was bright sunshine. So we just slobbed about the house for the morning. For the afternoon we drove up to Denia and had a light tapas lunch at an obviously up-market cafÃ© near the station. We then wandered around the shops as we are wont to do. Denia is obviously suffering as a surprising number of shops had closed. We then drove back to CalpÃ© for the free WiFi at Hotel Diamante Beach before passing the evening in our favourite bar. Finally we go home for supper. Our first truly to ourselves holiday day! If I was delicate yesterday morning the hangover lasted all day today! :-(. So a low start but we were still ready for our callers from Monasor. Again they were pleasant, helpful and professional. They will call us early next week when the quote is ready. 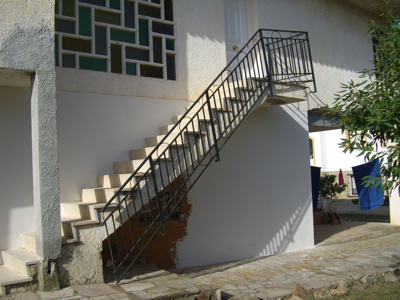 They told us that they are the largest and oldest established builders in CalpÃ©. 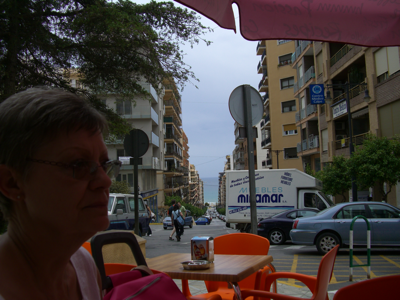 We then went into CalpÃ© and pottered, with a cuppa at CafÃ© Dany’s of course! Stopped at Las Barcas at the Port on the way home and played dominoes for a couple of hours, enjoying a couple of tapas for a light lunch. Eventually got home and Lynne invented ‘Arroz de Salchichon’ for a late lunch. Couldn’t get on the Internet by dial-up at and has to resort to Keith and his broadband to do some necessary Internet banking. Finished the day with a daily dose of hotel WiFi followed by a few at our favourite watering hole. Watched with interest as the Boss made Sangria. Made him laugh when I said “Es un pocito de todos!” meaning a little of everything. Then home for a nightcap and early bed for tomorrow’s adventure. A delicate and slow start to the day! Don’t remember finishing yesterday’s entry. Also phoned Monasor, the builder that our German neighbour recommended and insisted that we get a quote from. Candido doesn’t speak English but Abdellah does. Awaiting a call back to arrange a visit. Today we took Keith and Audrey out to lunch. The plan was to head to Guadalest and have lunch at Xorta but they are closed for their holidays. We headed for Guadalest anyway making our usual stops along the way. Now we have been aware of the restaurant ‘El Riu’ at the Farmer’s Co-operative, well you can’t miss the huge outdoor kitchen easily; especially when there is a tower of flame from the wood on it! So we decided to give it a go and what a success. They were very helpful from the outset and there was a good choice. Lynne thoroughly enjoyed her spatch-cocked brace of Quails grilled on the wood fire outside followed by Rice Pudding! We the spent a pleasant couple of hours wandering around the town. During which time the builder called and arranged to call at 10am the following day. Dropped off Keith and Audrey upon our return to Calpe and stayed for a drink or few. Ended up drinking their Gin all evening. Oops! Tottered home to bed about eleven. Another brilliant sunny day. Had our healthy ‘first breakfast’ of cereal, fresh fruit and yoghourt A great start to Builder Day 2. Not so great is that he does not arrive at the appointed time of 10 am. Poor guy spent half an hour getting lost and arrived at 10:30. He surprised us and overturned our prejudice that an English builder called Mick would be the usual rip off merchant. Instead he was very considered with attention to detail and even reprised what was wanted before leaving. It could be hard to choose! Took the gate chain key back to Keith and had a drink while sorting out his AFPO editing problems. Then wemt into town for keys to be cut. Came home via Diamonte Beach for WiFi and Mejias III. Ended up sittimg out on the balcony for a few more more drinks and some supper. Woke early after a short but solid sleep. Lynne was up at six and me not long after. First breakfast is healthy combination of peach, banana (and boy do they taste better!) and yoghourt. Early signs are for the forecast sunny day, and it developed nicely as we got ready to get into town to go to The solicitor’s office for the certificates of non-residence. Got into town at 9:30 and it don’t open until 10:00! So an opportunity for our first cuppa. Back to the solicitor’s office and yes they do have the file complete with licence etc. from the Town Hall. So head back to the car via CafÃ© Dany’s only to find that he’s closed on Mondays! 🙁 so head for the paint shop where Lynne hopes to buy some day-glow paints for her picture of the Council Worker from yesterday in CafÃ© Dany’s. So we stop at a place we’ve tried before and emjoyed a huge ‘racion’ each of Tortilla de Patatas for second breakfast. At the paint shop Lynne had no luck but as we had decided over second breakfast we went back to the Abogado’s and borrowed the file for the Obra Mayor. And so back to the house for a chill out lunch and afternoon waiting for Tristan with builder. I stuck back another three panes and did a list of works we want doing. Lynne and I both liked the builders that came with Tris. No nonsense guys to whom nothing was a problem. They gave us loads of time talking through all the jobs and in the process giving us the impression they do things right, not cheap. They are coming back next Tuesday with a quote for us. So that was Builder Day 1. Then we went out and did e-mail at the Hotel Diamante Beach before going Mejias III for a session. Once home had a nightcap before putting Lynne to bed and trying to sort out the PC which I think might have been compromised during Saturdays update which did not go smoothly! 🙁 and finally to bed myself. Funny night of fitful sleep and slept in till 9:15, only to wake to gentle rain! Well that saves watering the garden today. Slow lazy morning with no sign of the cloud lifting. Which stretched into the afternoon with a late lunch. Eventually bathe and dress to go down the Port for some games of dominoes. Find that the Benidorm boat is on again so decide to do it on Wednesday, builders permitting. Then on to the Hotel Diamante Beach for a dose of free WiFi. Ain’t modern technolgy wonderful! Sat in the bar of a Spanish (admittedly POSH) hotel chatting on IM to my daughter in Leeds about her impending birthday courtesy of the free WiFi. Makes being a techie worthwhile. Heated a ton of beans with breakfast meats for supper, lovely. But then realised we had no chocolate! Disaster and a must for Mercadona tomorrow. A few brandies for a nigtcap and off to bed around midnight again. Slept nine hours solid! Both of us! Gentle start to the day with healthy breakfast of honey, yoghourt and Nisperos, then off to the Calpe Market for ‘freshies’. Spent morning on the Market. Lynne bought some clothes and we got loads of fresh fruit and veg. We also got a cast iron plancha for the paella burner. Resulting shopping was too heavy to carry so Lynne stood with it on the main road closest to the market while I had to go and fetch the car. So we were very much in need of CafÃ© Dany by the end of that shopping expedition. We then had a troll down and up the Avinguda Gabriel Miro, stopping for a cuppa at Cafe Dani’s againt to write postcards only to realise we were still one short! So continuing we got another card and stopped in our other favourite cafÃ© Bar Buena Vista (it looks straight down Gabriel Miro to the sea) for yet another cuppa to write that one; then retrieved the car and headed home. Anyway, fully fed we headed for the bar via Mercadona, only to find it closed! Need to remember that Mejias III closes early on Saturday for Sunday off. So stopped in at what Lynne calls the “green bar” but they had bull fighting on the telly. Ended up in the Hotel Diamonte Beach and, whoo-hoo!! They have free WiFi! 😀 Ended up having quite a few drinks and got home at around midnight. So a late night to bed. Probably because of the nine hours sleep the previous night. Flight day! This trip we are taking the easy way and flying by Jet2 from Leeds/Bradford to Alicante and hiring a car. Look at the water meter when we arrive and its reading 562.8 Litres. The trip takes just over six hours door to door. The hire car is a Kia Picanto and quite nippy. Nice to have aircon that works! Greeted with the stair bannister virtually fallen off on the outside and a window pane fallen in on the inside; great start. More jobs for the builder. I was right about the boiler gas, our last bath last time finished the bottle. Went to Mercadona and got some essentials then to Aitana Bricolage to get sealant (better than putty here) to put the window pane back and a chain and lock for the gate. Then down to Mejias III our favourite bar for a few drinks and a meal, cannot face cooking on the first evening. Got a lovely warm welcome again. A few brandies at home and off to bed.